The transmission cooling system is an important part that is responsible for cooling the transmission fluid in your vehicle. In most power vehicles, the transmission fluid goes through a lot of pressure and heat while it circulates in the transmission system. So, it needs to be cooled down so as to keep it flowing as efficiently as possible. If you have an automatic vehicle or use your vehicle for heavy-duty towing purposes, then you need an external transmission cooler. This external transmission cooler will fit right above your radiator and provide your vehicle with superior cooling abilities. Our transmission cooler review below lists some quality models that you may want to consider if you’re looking for an external transmission cooler. Without any ado, let’s get started! This Hayden transmission cooler is a popular model that is quite effective at cooling the transmission system of almost all types of vehicles. If you drive for long hours or has a tow system installed where your radiator can get quite hot, then it is an excellent model to consider. Installation of this model is quite easy, and the manufacturer provides you will all installation accessories out of the box. It is rated with a GVWR of 24,000 lbs which is more than sufficient for most vehicles, ranging from trucks to general purpose vehicles like 4x4, cars, etc. Moreover, the 679 is a more powerful version of this Hayden transmission cooler for those with stronger cooler demands like owners of a towing vehicle where the transmission fluid can get quite hot. It is slightly bigger so as to provide a greater surface area which directly translates in faster and more efficient cooling. ​You can preheat the connector hose so as to increase its diameter if the connector hose is too small for your vehicle. It is made from a high-grade rubber material so it will have no problem loosening under heat and tightening again on the connector when cold. Of all B&M transmission coolers, the B&M 70255 is the most competitively priced. 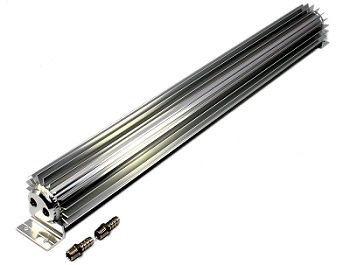 It is easy to install on top of almost any radiator and comes with all installation accessories. Furthermore, the aluminum fins do a great job dissipating heat. If you want your transmission system to run cool, this unit is well worth the consideration. It has a black finish and made from a special lightweight alloy which is very resistant to wear and tear as well as corrosion. Best, this transmission cooler is backed by a 1-year manufacturer warranty. Based on a price to performance ratio, this model is definitely one of the best transmission coolers that you can currently buy. If you need a little bit more performance, then the B&M 70264 and 70268 are both excellent choices. They are larger, so they have more surface area for cooling down your transmission system. In fact, the largest model, the 70268 has a dimension of 11 inches x 7-1/4 inches x 3/4 inches which means it will have no problem cooling down the transmission fluid of a large power vehicle like a towing vehicle. As with all B&M transmission coolers, you are guaranteed to get a long-lasting and durable transmission cooler that is virtually compatible with any vehicle on the market. If you are not sure about which transmission cooler to get for your vehicle, then transmission coolers by B&M are generally a safe bet. 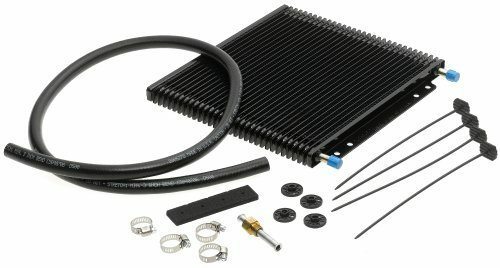 Derale is a popular and reputable brand that makes high-quality transmission coolers for any types of vehicles, whether it is a regular car or a powerful vehicle like a tow vehicle. The 13502-transmission cooler, as well as other models like the 13503 and 13504 by this brand, are highly efficient models that are made from a furnace-brazed aluminum construction. This model has a typical square-shape, which is quite rare because the rectangular shape is by far the most popular shape for a transmission cooler. The main advantage of this square-shape is that it should be able to fit a wider range of radiators than a rectangular shape. Therefore, it is very durable and long-lasting and will not corrode even when it comes in contact with motor oil. In fact, the build construction of this transmission cooler is one of its outstanding features because it is also resistance against regular wear and tear, high-temperature as well as regular corrosion. Furthermore, since it has a large surface area with a length of 18.6 inches, it is able to dissipate heat much faster when compared to other transmission coolers. So, it is significantly more efficient. But what we really like about this model is its very affordable pricing. 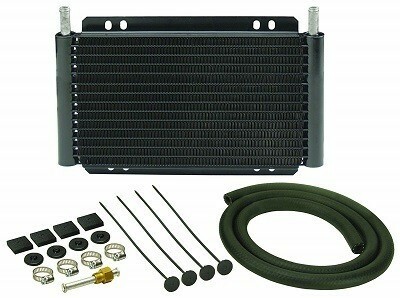 Indeed, when it comes to price, this model is definitely one of the best transmission coolers for the money. Most people are familiar with the square or rectangular transmission cooler. However, this Assault Racing unit is a brand-new design that looks more than an aluminum bar than anything else. Furthermore, this model sports its name well because it is definitely a racing product that is efficient, heavy-duty, and affordable as well. It has a length of 24 inches and a height of only 3 inches so it will also not obstruct the radiator once installed. However, despite its atypical shape, it has an excellent transmission cooling capability. 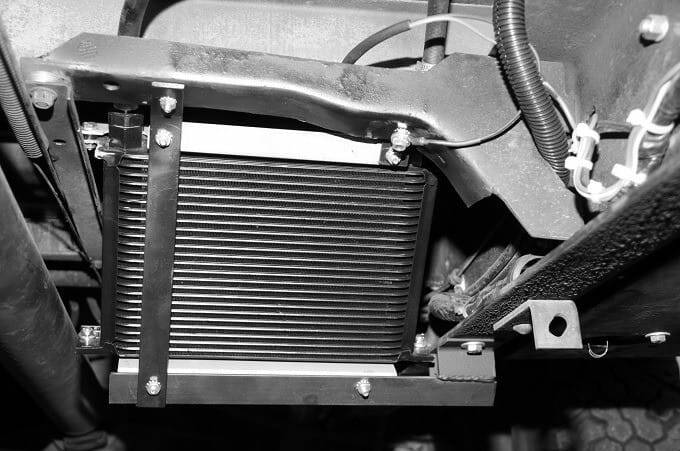 Due to the shape and form factor of this transmission cooler, it is not recommended to be used in power vehicles like towing vehicles. This is because it simply lacks the cooling capabilities of other high and transmission coolers that you will find in this review. You will get all installation accessories out-of-the-box, and the installation itself is quite beginner friendly. When it comes to construction, it is made from durable aluminum that will not corrode or degrade over time. In addition, the price is very affordable when compared to other transmission coolers in this review. 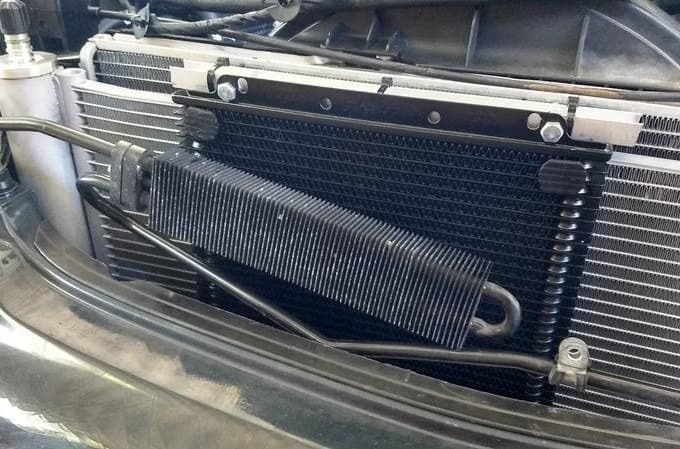 If you have the place in your vehicle to install such a long transmission cooler, then go ahead. You will not regret it as this model is not only easy to install, but it’s affordable and will not create any obstruction behind the radiator! Since this transmission cooler has a long length of 24 inches, you must make sure that you have the necessary installation space in your vehicle. 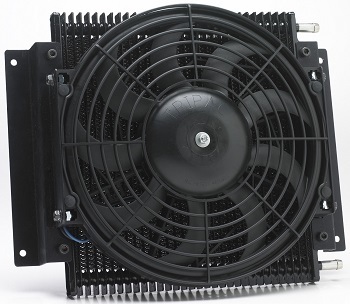 One of the biggest advantages of this Hayden transmission cooler is that it can be used as both a manual and a regular transmission cooler that you connect to your transmission system. Additionally, you can also use it as a thermostatic transmission cooler which means that it will automatically start working every time there is a spike in temperature. Therefore, this makes it significantly more energy efficient when compared to other transmission coolers. This model will prove to be highly beneficial especially for those who do not have a powerful alternator to power a big transmission cooler. Therefore, it is an excellent transmission cooling solution for both a power vehicle as well as a regular vehicle like a car. In addition, it has a large fan right on top of the transmission cooler grill which provides it with superior cooling ability. If you have a powerful vehicle like a towing vehicle, then we seriously recommend this Hayden model because of its high performance and efficiency. The weakest link in this transmission cooler is its fan as this is the first part of the transmission cooler that may fail over time. However, it is quite easy to replace, and it shouldn’t cost you that much either. If the price is a major concern to you and has been the only reason why you are still hesitating to get a transmission cooler, then the HotRod99 is here to the rescue. Indeed, based on price alone, this model is the best choice for anyone. Moreover, it is available in a wide range of sizes to suit your transmission cooling needs. You can also get it in different colors. The build construction of this top-rated transmission cooler is made from aluminum, so it is quite durable and long-lasting. It will not corrode and degrade over time. Moreover, the installation is very easy, and this transmission cooler already has predrilled holes at the base for easy mounting. If you are looking for a heavy-duty and highly efficient transmission cooler, then this model by Mishimoto should interest you. Indeed, this model is regarded by many as being the best transmission cooler for towing because of its superior ability to cool the transmission system of any power vehicles. But what really separates this model from the rest of the competition is that it comes with a lifetime warranty by Mishimoto. Furthermore, it has an 8 inches fan installed on top of the aluminum grills that will allow it to cool your transmission system much easier when compared to other models. 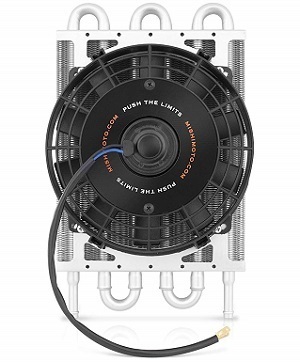 In addition, the fans are thermostatic, so it will automatically start spinning when it detects a rise in temperature which makes it more efficient when compared to other manual transmission coolers. The build construction is also superb as it is made from a high-grade aluminum alloy that will not degrade or corrode over time. Truly, this transmission cooler is a game changer when it comes to performance and efficiency. If you can afford it, go get it! Tube and Fin Cooler: This type of cooler is widely used mostly because of its affordable price. It uses a copper coil pack that has a weaving pattern and surrounds the transmission cooler. The copper coils help cool the transmission fluid when it passes inside the transmission cooler. However, even if this type of transmission cooler is the most affordable solution, it is not the best transmission cooler in terms of efficiency. Plate and Fin Cooler: The plate and fin cooler is very similar to the tube and fin cooler above. However, it is more efficient and uses a layout of horizontal tubes rather than a weave for cooling the transmission fluid. 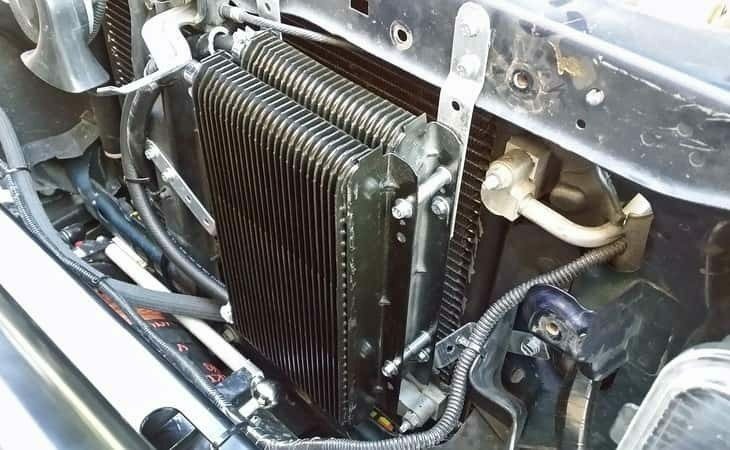 The tubes are aligned in a row, and this type of transmission cooler is very compact so it can be installed in vehicles that have tight spaces. Stacked Plate Cooler: By far, the stacked plate cooler is the most efficient transmission cooler that you can buy. It is very popular because it has a high cooling efficiency as well as consumes little space once installed. However, the main problem with the stacked plate cooler is its high price. You need to refer to the GVWR or gross vehicle weight rating so that you can find an appropriate transmission cooler for your vehicle. Basically, this is the maximum amount of weight that any designated vehicle can withstand. It generally ranges anywhere from 10,000 lbs to 30,000 lbs depending on the vehicle. If you’re not sure, you can normally find your vehicle’s GVWR value printed at the side of the driver’s door. Logically, if your vehicle has a high GVWR, then it will need more transmission fluid which in turn requires a larger size transmission cooler because there is simply more cooling to be done. Before purchasing the transmission cooler, you should ensure that it is perfectly compatible with your vehicle. You will be amazed, but not all transmission coolers are actually compatible with every vehicle as this is not a universal car accessory. Some are heavy-duty transmission coolers that have a big size and are intended for power vehicles and towing vehicles, while others are smaller and made for regular vehicles. Efficiency is at the heart of the transmission cooler. After all, how the transmission cooler cools down your transmission fluid will depend on how efficient it is. Therefore, keep an eye out for any mention by the manufacturer on how efficient their transmission coolers are. Additionally, you can also check consumer reviews and comments to get an idea on the transmission cooler efficiency. 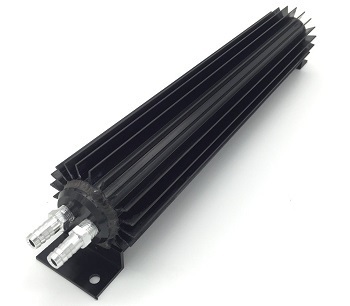 The build construction of the transmission cooler will dictate how durable and long-lasting it is. Most manufacturers generally use a sturdy aluminum construction for their transmission coolers. Aluminum conducts heat really well and also does not corrode, so it is an excellent material to be used in a transmission cooler. Since the transmission cooler comes with predrilled holes, it is very easy to install. There is simply no drilling or complicated installation maneuvers that you need to perform. However, if you have never installed a transmission cooler in your vehicle before, it is always a good idea to go with a transmission cooler that comes with a detailed and well-illustrated installation manual. In addition, ensure that the manufacturer ships their coolers with all installation accessories so that the installation process goes smoothly. Even if the transmission cooler is not the most expensive car accessory, it is still important to plan a budget and stick to it. In most cases, you should be able to buy a decent transmission cooler below $100. The transmission cooler may look intimidating, but it is easier to install that you think. Here is a stepwise manner on how to proceed with the installation. It is important that you first locate an installation area on your radiator. This installation spot should have good airflow that will make your transmission cooler even more effective. The front of the radiator is the best cooler location because when the vehicle is moving, it gets a constant flow of fresh air which further aid the cooling process. In addition, make sure that there will be no physical contact between the transmission cooler and other moving parts of your vehicle. ​Your transmission cooler should already have pre-drilled holes that will make it easy for mounting at the front of the radiator. Under normal circumstances, there is simply no drilling that needs to be done. The lines are the metal or rubber tubes that you used to connect the transmission cooler to the rest of your transmission system. The manufacturer should already have provided you with the necessary lines and installation accessories. Make sure that the lines do not touch any moving parts for safety reasons. You may need to consult your instructions manual to know exactly which line to connect to your radiator and want those in your transmission system. The external transmission cooler not only helps cool your transmission system but it also helps extend its lifetime. 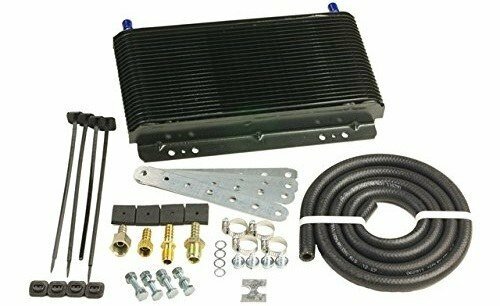 If you have a powerful vehicle for towing or other types of power vehicle, then the transmission cooler is an absolute must-have! You simply install it on top of your radiator, and you’re good to go. They come will all installation accessories so the Installation itself is easy and no experience is necessary. But best, most transmission coolers come with pre-drilled mounting brackets, so you do not have to drill anything. Finally, our transmission cooler review above goes through a few popular and worthwhile models. If you haven’t decided which transmission cooler is right for your vehicle yet, then read it again.